Folklore Fabric Tie – Handmade for You! 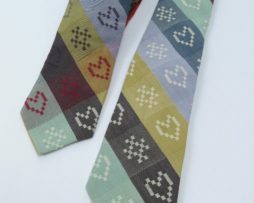 My hand finished Folklore Fabric Tie is available in two colourful colourways; Ecru or Multi(coloured). You just now need to decide which suits you best? Folklore Fabric is unique to my shop and is an exciting collaboration between myself, as the designer, Richard MR Smith, a master weaver and the talented folk at Weisters Mill in Darwen, Lancashire. My Folklore Fabric Ties are cut to a contemporary shape & length, can be dressed up or down and will add a joyful colour pop to any outfit. 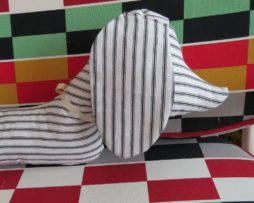 Inspired by a Dachshund Draft Excluder my Granny had when I was growing up, Scraps is the first of my extended home wares range, that also compliments my 100% British Made quilts, cushions & more for your home. 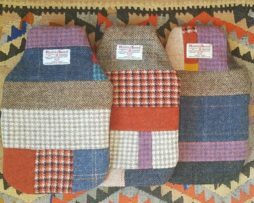 Keep warm and cosy during wintry weather with a one of a kind 100% British Made Harris Tweed Patchwork Hot Water Bottle Cover. 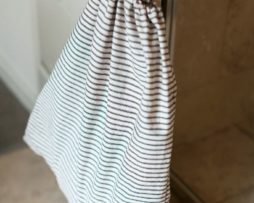 V.Useful BIG B&W Drawstring Ticking Bag, measuring at least 50cm by 60cm, ideal to hold all the flotsam&jetsam from your life. 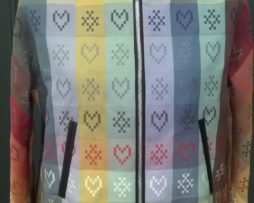 My Folklore Fabric jackets can be dressed up or down and will add a joyful colour pop to any outfit. 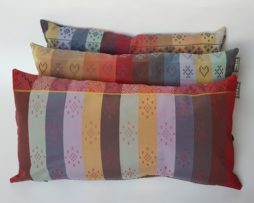 Harris Tweed Patchwork Cushions, 100% British made & One of a kind. Every cushion is distinctive and unique, made up from a combination of all the Harris Tweeds and backed with British Velvet or my Folklore Fabric. Which one will you choose? All my cushions come with a duck filled feather cushion pad, also made in GB! 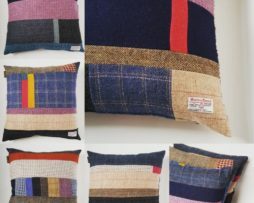 These cushions will compliment any of my Harris Tweed quilted throws-quilted bedspreads-quilts, or look standalone fabulous in any interior scheme. These cushions are a real colour tonic to counteract dreary days. New for 2019 Folklore Fabric Cushions are now available in even more delicious colourways and weaves and in four sizes; 70cm square; 50cm square; 60 by 30cm & 45 by 25cm. Folklore Fabric is unique to my shop and is an exciting collaboration between myself, as the designer, Richard MR Smith, a master weaver and talented folk at Weisters Mill in Darwen, Lancashire. These cushions will compliment any interior scheme and are a real colour tonic to counteract dreary days. These Folklore 2m cotton fabric lengths are inspired by traditional universal patterns and are woven with care in Lancashire. 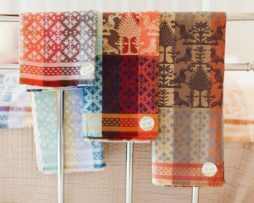 Folklore Fabric is inspired by traditional universal patterns. The 60cm by 145cm lengths can be used as decorative scarfs to brighten up an outfit or as a tablecloth runner on your dining room table, it’s up to you the individual to decide as these cloths are multi functional. Follow the making of Folklore fabric story on my Pinterest page. 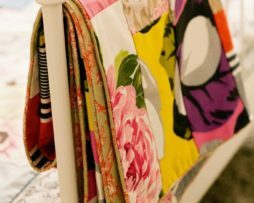 The Vintage Liberty and Tana Lawn Lighter Weight Summery Quilts combine the Best of British quintessential Liberty retro prints in a strip patchwork design. 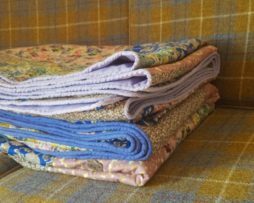 P.S I can also stitch you a bespoke one of a kind Liberty of London Tana Lawn patchwork quilts. Look at my bespoke commissions page for further details. 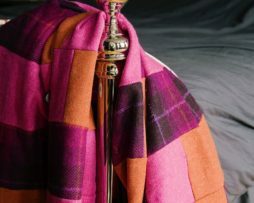 Orange, hot pink and purple tartan Harris Tweed & brown mole velvet double patchwork quilt, 100% British made heritage quilt with a contemporary twist. 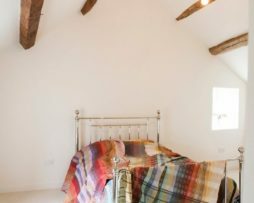 This quilt is stitched in a traditional strip design made from; bold orange, hot pink and purple tartan Harris Tweed strip quilt, trimmed with Panpuntum, an Indian inspired printed cotton by contemporary homes ware company Tinsmith and backed by a brown mole velvet.